MR. D.I.Y. ECOMMERCE (M) SDN BHD can only send orders to street addresses in Malaysia. We do not deliver to P.O. Box addresses. MR. D.I.Y. ECOMMERCE (M) SDN BHD's delivery will only be limited to local delivery only. MR. D.I.Y. 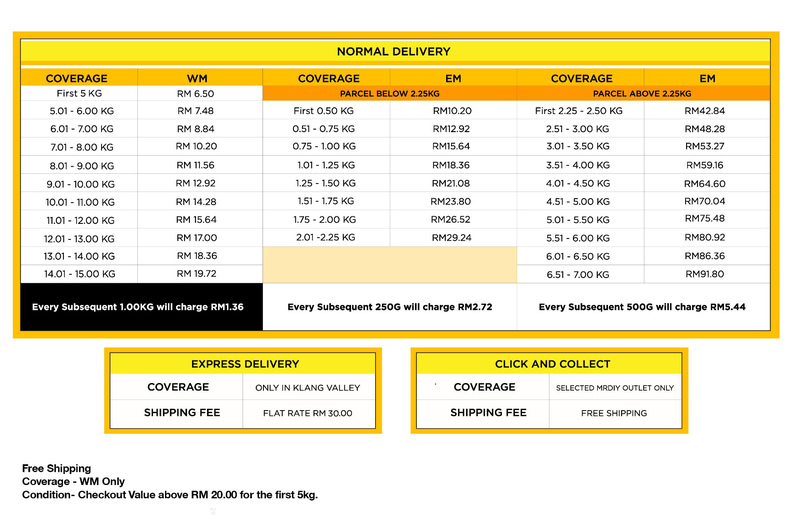 ECOMMERCE (M) SDN BHD charges a standard shipping & handling fee of RM6.50 for the first 5KG on all purchases. For every subsequent KG following the first 5 will be charged of a standard rate which subject to our delivery rate card based on the delivery address. For all (and only) West Malaysia purchases which has a checkout value above RM20.00 will get to enjoy our promotion of "Free Shipping" for the first 5KG of their purchases. * Customer may opt to pay a higher transaction fee should you desire express delivery options or delivery of items exceeding certain designated dimensions or weight. Please locate your tracking number (example: MY18000000000) in the delivery confirmation email or by logging into your registered user account. 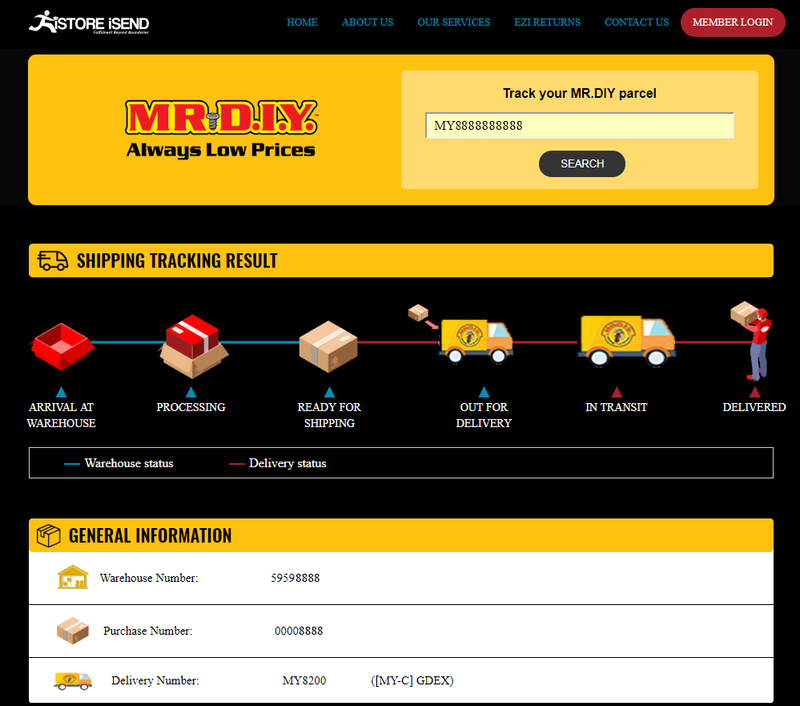 Alternatively, you can click here to check your parcel delivery status via our MR.DIY delivery tracking website page. You may then enter your tracking number into our tracking field (the white colour empty field that is under these words - Track your MR DIY parcel) to view the status of your order delivery. Please take note that tracking numbers may take a few hours to be reflected in our tracking system after you have received the delivery confirmation email. If there is an unfortunate event of a delay, it will be reflected in our MR.DIY tracking website. In the event that you have not received delivery updates within a week after receiving the confirmation email, please contact our customer service via email ([email protected]com) for further assistance.